Mayan Civilisation took birth during what is known as the Pre-Classic Period. This period extended from 2000BC to 250AD. By the Late Pre-Classic Period, the Mayans had developed urban centres and this gave rise to a distinct Mayan culture along with Mayan customs and traditions. By this time, they had also developed their religious system, although actual advancements in the civilisation were to come about during the Classic Period which followed. A lot of Mayan customs and traditions revolved around religious concepts. From the depictions during the Classic Period, Itzamna was the name of one of the supreme Mayan gods who resided in the sky and was responsible for the creation. Itzamna was involved in a lot of Mayan customs and rituals. For instance, he is often depicted as high priest and identified as god of the ruler-ship. Itzamna was thought to represent himself in different human forms and thus various Mayan rulers including Yaxchilan, Dos Pilas, and Naranjo used Itzamnaaj as part of their titles. In daily life, Mayan customs revolved around work, clothing, and general ways of living. Clothing varied depending on the social status of the individual and therefore members of the nobility could wear more elaborate clothes compared to the commoners. Mayan customs and laws forbade the commoners from wearing clothes that were similar to the nobility. Slaves were used in the daily life of the nobility, although Mayan customs prohibited them from using their own people as slaves and thus captured prisoners were used for the same purpose. Religion was supremely important in Mayan society and a lot of Mayan customs revolved around it. As per the customs, it was the priests who performed religious ceremonies and sacrifices. As per the religious customs, members of the royalty indulged in the practice of bloodletting during all the religious ceremonies since their blood was considered sacred and thus a valuable offering to the gods. Dead people were usually buried inside or behind the house after being laid down in the tomb idols. Various objects were buried with the dead people according to their profession, for example a dead priest would be buried with his sacred books. Mayans had a polytheistic religion and more than 150 gods and goddesses were worshipped. In Mayan customs, it was thought that the dead ancestors had divine status and thus they were worshipped by their respective families. Offering in the form of food and material possessions was common in order to seek the favour and help of the gods. During religious ceremonies, dancing and singing were common Mayan customs and so was dressing up like gods. Mayan rulers were considered the descendants of gods and thus their blood was thought to be sacred. Mayans performed a variety of sacrificial rituals to appease the gods and seek their blessings. Other than offerings in the form of food and material possessions, sacrifice of animals and even humans were among Mayans customs. 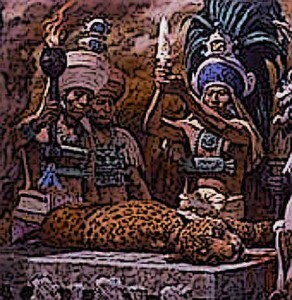 Human sacrifice was generally offered during rare occasions such as death or ascension of a ruler or a severe drought. Different methods were used for human sacrifice including disembowelment, cutting out of the heart, killing with bow and arrows, and others. The sacrifice was performed by the priests and usually took place on the top of the temple-pyramids. The sacrifice of the members of royalty was considered of highest value and for this purpose captured members of enemy royalty were used during religious ceremonies and festivals. Rulers and nobles had a special status of privilege in the Mayan customs. Rulers were considered divine descendants and possessing of sacred blood. Different cities in the kingdom were ruled by different rulers who were assisted by the local nobility. Nobles were thought to be the descendants of the famous Twin Heroes from Mayan mythology. Nobles had their attendants with them all the time and a common person could communicate with them only through their attendants. They wore lavish clothes which were forbidden to the common people. They also draped themselves with elaborate jewelry and painted their bodies with tattoos. The bulk of Mayan population was composed of the peasants since agriculture was the main profession. The life of peasants was hard since they had to toil on the land of the nobles in return for meagre sustenance. Some peasants also had small lands of their own. Peasants led simple lives since they were not allowed to wear the clothes used by the nobles. Slaves had no rights although they were not treated harshly. Mayan custom forbade the enslavement of their own people and thus slaves consisted of the common people of other cities captured in wars. Mayan tradesmen were the people who indulged in a variety of professions such as trading in different goods, creating different kinds of crafts, and dealing in precious stones and metals. Tradesmen were well off compared to the peasants. However, Mayan customs forbade them the display of their wealth since this privilege was reserved only for the nobility. Mayan customs in the domain of education reserved education only for a select few. Thus formal education was given only to priests, warriors, or people who were to be groomed for leadership. Naturally, these people came from the nobility. As for the common people, they did not receive any formal education. Their education was informal and undertaken by the family elders at home. It included different things from Mayan mythology and rituals to everyday skills such as farming and hunting. Over the course of three thousand years of their civilisations, the Mayans developed a variety of customs and traditions. The social structure of Mayan society was hierarchical with the nobles having a lot of more privileges compared to all the sections of the common people. Rich Mayan customs were associated with religion and thus the priests also enjoyed a very high status in society. Member of the royalty were thought to possess sacred blood and this gave rise to the custom of bloodletting during religious ceremonies.